Are you a real nature enthusiast? Do you feel the best when trees and grass surround you? If so, you are certainly going on a camping trip often. Being myself of a similar attitude, I have decided to review pieces of equipment which are essential for every staying outdoors. 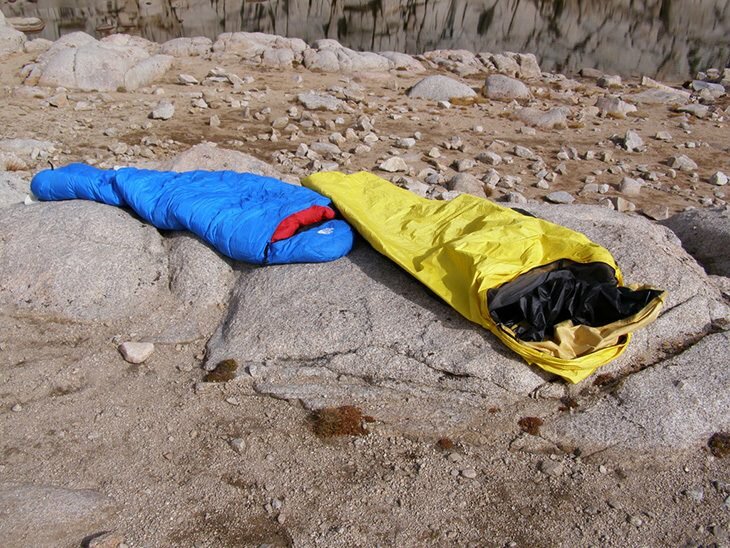 Sleeping bags are next to a tent, the most important item you must bring with you when you are camping. Even if you are not an everyday visitor to any camping spot, you can take the bag in your backyard and sleep under the stars. ​But, what if I tell you that you can have both the tent and the sleeping bag in one? Bivy sack is exactly that. It looks like the sleeping bag, but it has an overlap which covers you completely, which is very convenient to protect you from mosquitoes and flies and the biting frost if you are fond of camping during winter months. 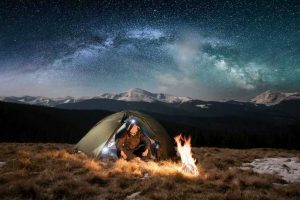 Whenever I’m outside camping, I love to be as comfortable as possible, so these are my top favorite sleeping bivies. To be honest, I wanted to pass on this deal. The price seemed to me a bit too much, so I wanted to find a better solution. Then, I have noticed that it comes in several parts, and it got my attention. Made of three layers of material which all can be snapped together depending on the climate you are sleeping in, and this is the most prominent feature of this bivy. I have expected that I will get tangled in so many layers, but I was wrong. 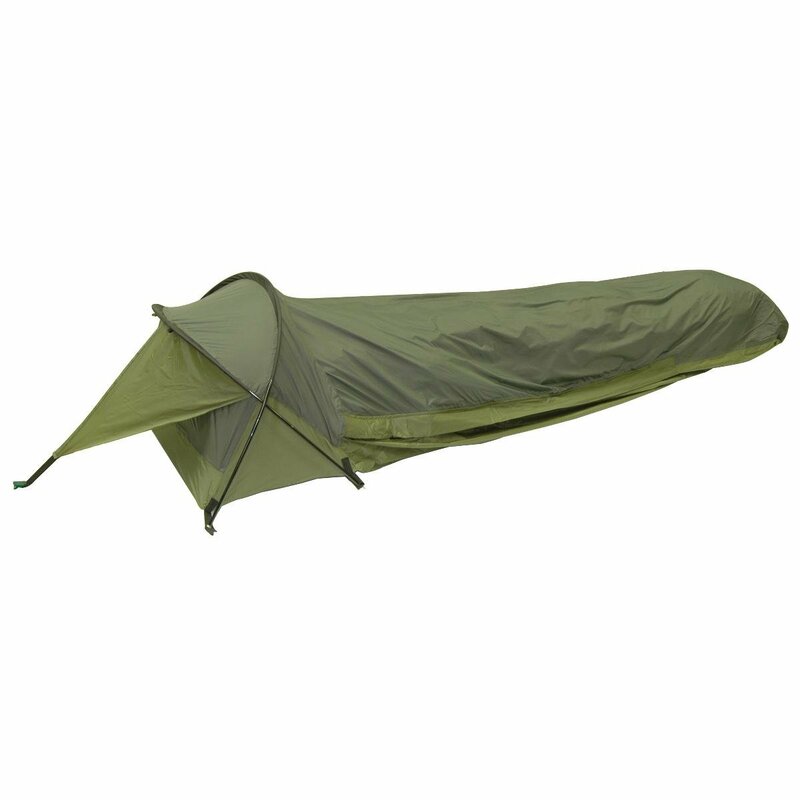 The most notable thing about this bivy is that it is made of quality nylon and polyester, with padded floor and completely sealed seams. With its average weight of 859g, and size when packed of 39cm x 10cm x 10cm, the length of 221cm, and a maximum width of 66cm, it is spacey, but not very much. I could fit my sleeping bag in, along with backpack and shoes, with slight discomfort, but nothing unbearable. When it comes to safety, this model had drawn my attention. Made of quality nylon and polyester, it has several welded anchor spots which can be attached to stakes to improve stability and prevent you from turning over. The first thing I have noticed is its bright yellow color, and it is quite visible due to its length. The extra space at your feet can be filled with backpack and shoes, to keep them dry. But, this comfort comes with a backslash, which is its size. The construction of this bivy was rather impressive to me. Rather than sewn-in holders, this model sports exterior frame which holds the headpiece very well. The downside of this approach is that you have additional bars to pack and carry it with you. Overlap is good, and can be closed completely for an average protection from rain, or to be substituted with an anti-mosquito net which can eliminate condensation, but if the rain surprises you during the night, you are bound for an unpleasant awakening. 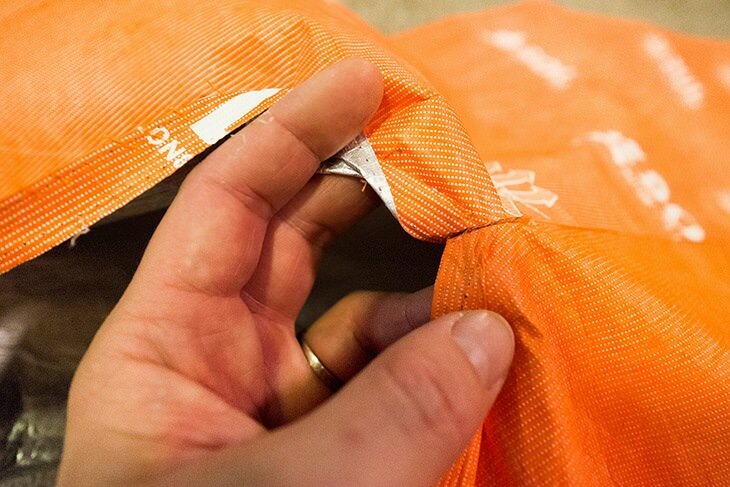 ​Since bivy is a closed-type of the sleeping bag, you must set the materials used as the highest priority. In general, materials which are used must be able to emit and contain heat, meaning that it will keep you cool when it is hot, and warm when it is cold. Luckily, science is coming to your aid, so this is not something impossible. Oxford had made a program which students can attend, so this states how important this is. Still, keep an eye. ​As for padding, my experience is that few can parry to cotton. It is somewhat light, and its heating capabilities are unmatched because it will keep you warm, but without that suffocating and moist heat which is mostly connected to polyurethane. 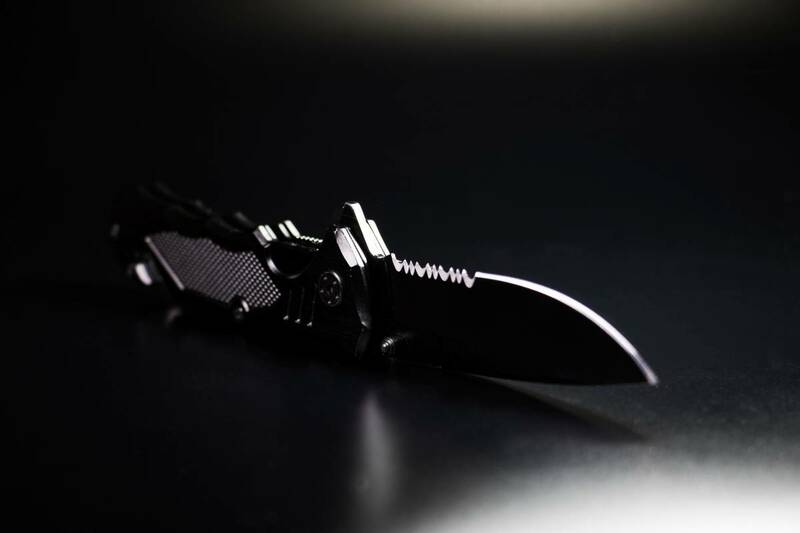 The zipper should be durable, preferably metal with small teeth, because those are easy to flex. Also, the force needed to break this kind of zipper would have to be much bigger. Speaking of metal, any metal parts should be made of the non-rusting material such as brass and aluminum. You will take the bivy outside, and if it rains, the metal will deteriorate. Although this is somewhat a standard, be sure to check this up. 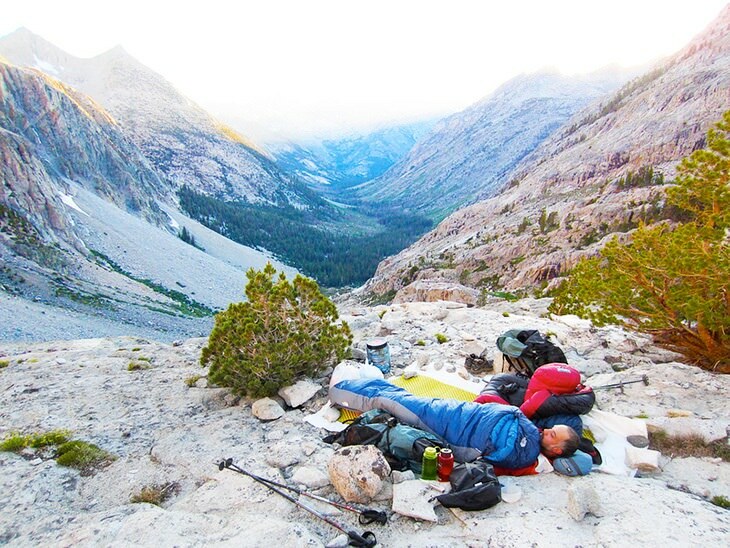 ​How long the bivy will depend on your height, of course. Think about the bivy as about a good sock. If it is too short, your head will be left out the protective area. On the other hand, if it is too long, you will probably awake tangled in it. To prevent this, I tend to fill up space left with my backpack and shoes, especially if it is raining. Dry equipment is vital. Therefore, the best recommendation is to try it out if it is possible. If not, you must take the measuring tape, and measure your height. Every supplier will inform you about the size and measures of the particular bivy, so you can see if it fits you. ​Also, the girth is of importance. Too tight, and you will feel trapped, and this can lead to some serious nightmares. It had happened to me a couple of times, and I woke each time so tangled up in sheets that I could barely move. On the other hand, if the bivy is too comfortable, it will be unable to heat you up properly, leaving you with the sense that you are spending the night in a freezer. Since you are camping outside, you will be limited when it comes to weight. Here the rule is simple. The lighter, the better. Also, that bivy which can be put in a backpack is good, but it is rarely possible. Nevertheless, watch for the weight of packed bivy, because even a half a kilogram can make a drastic difference during the long walk. 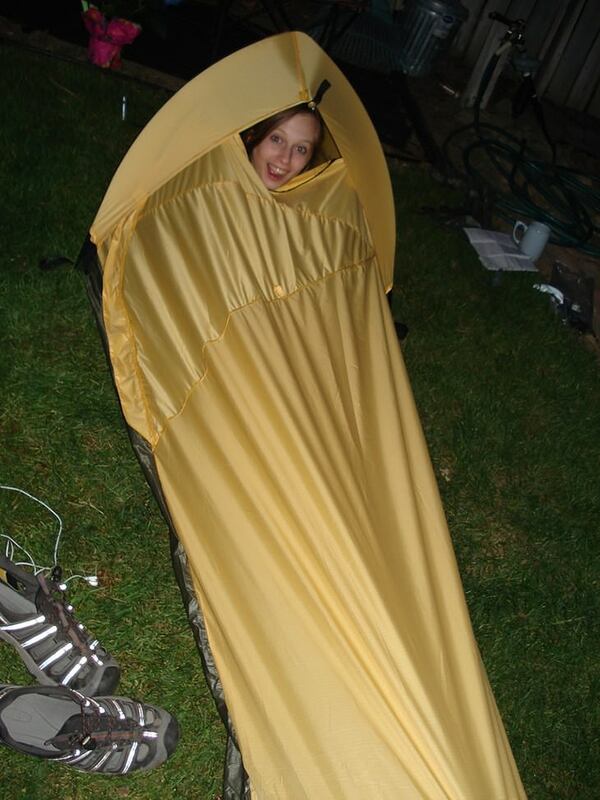 Of course, if you are camping during a colder period, it is impossible to carry light one, so heavy bivy is a must. Even in this case, see that you choose as light one as possible. Extra padding can get wet in the snow which can only increase its weight, and because of that see that outer layer of material is highly resistant to weather conditions. Also, those bivies which have packing bag are great, because this solves you one issue, and makes the carrying much lighter and bearable. How often will you use your bivy? Which is the highest price you can afford? Are you considering something for a professional, or you are going to sleep in your backyard? 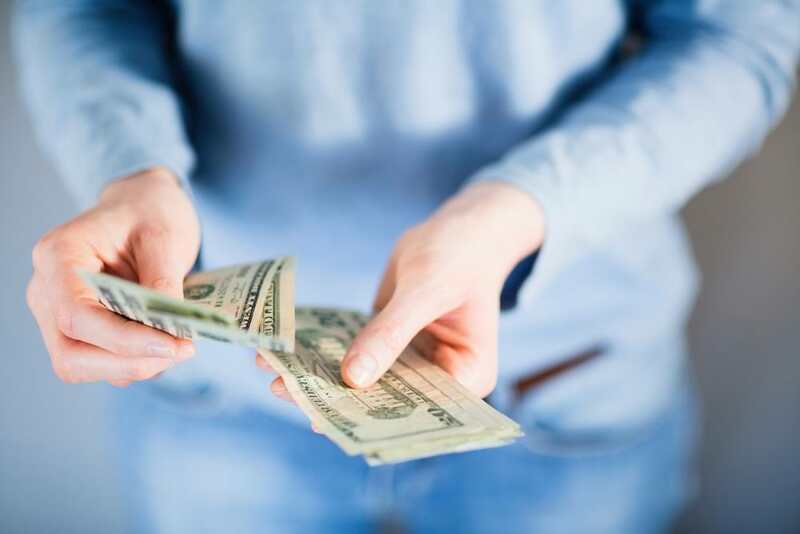 ​When you put the answers to all of these questions to the paper, you will get the range of price in which you should look. Of course, if you have a person you trust which is selling used one, this is also a good recommendation. Keeping the bivy clean is also an important thing to take into consideration. If washing requires professional assistance, you should look somewhere else. Those which can be washed in a washing machine are the best kind. You just put it inside, and the washing is done. However, be careful that you are following the washing instructions. If you wash it with too hot water, you may cause irreparable damage. Many seams are over-glued, and often this glue is not resistant to high temperatures. Drying is also a bit troublesome, because of the thickness of the material, so those which can be separated into several parts are also quite convenient. To be honest, I wanted to pass on this deal. The price seemed to me a bit too much, so I wanted to find a better solution. Then, I have noticed that it comes in several parts, and it got my attention. Made of three layers of material which all can be snapped together depending on the climate you are sleeping in, and this is the most prominent feature of this bivy. I have expected that I will get tangled in so many layers, but I was wrong. All of the parts are fitting to one another like a glove, so you have the feeling that all of those is one bivy, which is great. ​Also, the zipper system just blew my mind, because it is reliable, and yet leaves you with the possibility to get out fast. The color is of woodland disguise, which gave somewhat of “hunter and gatherer” vibe, which I also liked. To be honest, I wanted to pass on this deal. The price seemed to me a bit too much, so I wanted to find a better solution. Then, I have noticed that it comes in several parts, and it got my attention.Made of three layers of material which all can be snapped together depending on the climate you are sleeping in, and this is the most prominent feature of this bivy. I have expected that I will get tangled in so many layers, but I was wrong. 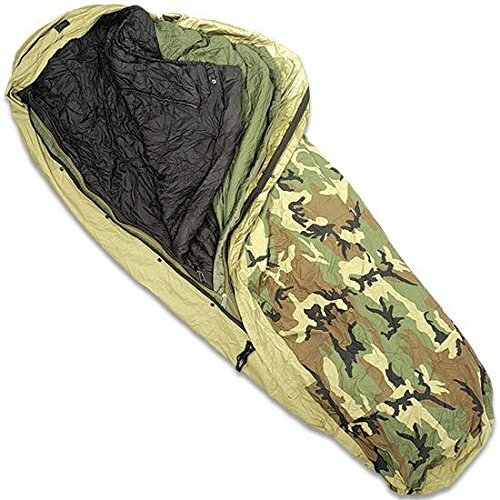 The most notable thing about this bivy is that it is made of quality nylon and polyester, with padded floor and completely sealed seams. With its average weight of 859g, and size when packed of 39cm x 10cm x 10cm, the length of 221cm, and a maximum width of 66cm, it is spacey, but not very much. I could fit my sleeping bag in, along with backpack and shoes, with slight discomfort, but nothing unbearable. Heat containment is great, I have slept in sleet and rain, and nothing came through. During colder weather, the condensation may appear, and it might be somewhat of trouble, forcing you to open the overlap to let the steam out. 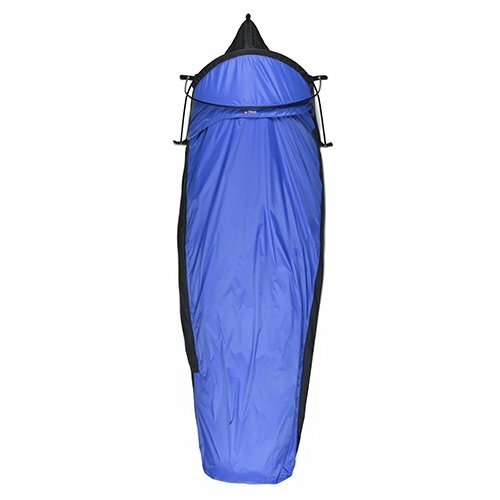 The most notable thing about this bivy is that it is made of quality nylon and polyester, with padded floor and completely sealed seams.With its average weight of 859g, and size when packed of 39cm x 10cm x 10cm, the length of 221cm, and a maximum width of 66cm, it is spacey, but not very much. I could fit my sleeping bag in, along with backpack and shoes, with slight discomfort, but nothing unbearable. When it comes to safety, this model had drawn my attention. Made of quality nylon and polyester, it has several welded anchor spots which can be attached to stakes to improve stability and prevent you from turning over. The first thing I have noticed is its bright yellow color, and it is quite visible due to its length. The extra space at your feet can be filled with backpack and shoes, to keep them dry. But, this comfort comes with a backslash, which is its size. A bit clumsy when packed, it is still a good solution for beginners which are planning the trip during warmer months, because this model is not the best option when it comes to snow. The price was a pleasant surprise, and it is just another factor to make you consider it. When it comes to safety, this model had drawn my attention. Made of quality nylon and polyester, it has several welded anchor spots which can be attached to stakes to improve stability and prevent you from turning over.The first thing I have noticed is its bright yellow color, and it is quite visible due to its length. The extra space at your feet can be filled with backpack and shoes, to keep them dry. But, this comfort comes with a backslash, which is its size. The construction of this bivy was rather impressive to me. Rather than sewn-in holders, this model sports exterior frame which holds the headpiece very well. The downside of this approach is that you have additional bars to pack and carry it with you. Overlap is good, and can be closed completely for an average protection from rain, or to be substituted with an anti-mosquito net which can eliminate condensation, but if the rain surprises you during the night, you are bound for an unpleasant awakening. The price is also below average, which is a factor which can swing you this way. The construction of this bivy was rather impressive to me. Rather than sewn-in holders, this model sports exterior frame which holds the headpiece very well. The downside of this approach is that you have additional bars to pack and carry it with you.Overlap is good, and can be closed completely for an average protection from rain, or to be substituted with an anti-mosquito net which can eliminate condensation, but if the rain surprises you during the night, you are bound for an unpleasant awakening. All the things considered, I have to say that Military Modular Sleep System 4 Piece with Goretex Bivy Cover and Carry Sack was my choice. Although it is the most expensive one, those three layers drew me the most, and I feel I can push it to the limit, and to spend the night at -30 degrees Celsius. Also, the material used to make one of these seems to me as the most quality one, the military-grade one. Even if it is a bit large, I was able to attach it to the bottom of my backpack, to prevent it from getting stuck in the bushes and branches. So, what are your experiences with bivies? Do you like them, or you will rather bring a tent with you? Feel free to share your experiences with us in the comment section below.